International Journal of Research in Health Sciences,2014,2,1,118-125. 1Assistant Professor, Department of Community Medicine, Govt. Medical College, Ananthapuramu, Andhra Pradesh, INDIA. 2Post Graduate in Anatomy, Govt. Medical College, Kurnool, Andhra Pradesh, INDIA. Background: Unmet need for contraception determines the percentage of fecund women in reproductive age group who want to delay or avoid childbirth but are not using any contraceptive method. Such an enquiry helps also to find out the reasons and therefore inform the family planning programs about the needs of the community in terms of their fertility preferences. 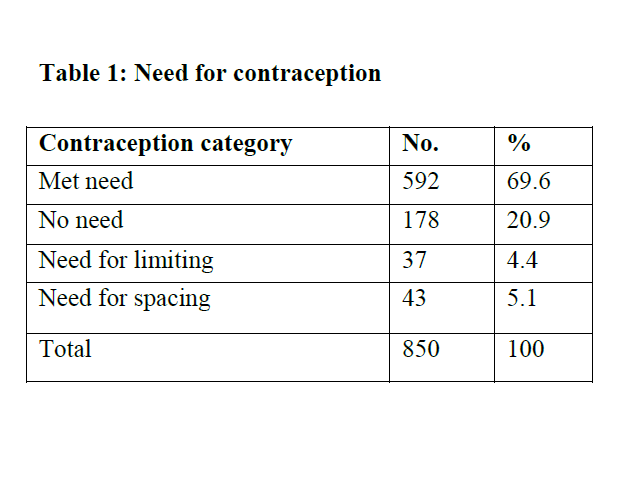 This study seeks to determine the prevalence of unmet need for contraception and the reasons for its existence among married women in reproductive age group of 15-49 years attending the district hospital, Ananthapuramu. Existence of unsafe abortion in the community is a strong proxy to the existence of unmet need for contraception among women of reproductive age group. Objectives: To measure the prevalence of unmet need for contraception among married women between the ages of 15 and 49 years attending the district hospital, Ananthapuramu, to identify the reasons for unmet need for contraception in this community, and to assess the knowledge about modern methods of contraception among married women of reproductive age 15 – 49 years among the same. Materials and Methods: This is a cross-sectional study, conducted among the outpatient women attending the district hospital, Ananthapuramu and the study is carried out for two months from September to October 2013, among the women attending the outpatient departments of gynecology and obstetrics in the district hospital, Ananthapuramu district of Andhra Pradesh. Results: The mean age of women in the study was 33.4 years and standard deviation (SD) 7.9 years and mean age of their husbands were 40.8 years and SD 9.0 years. 900 women were recorded and 850 were interviewed (94.4%). Conclusion: Unmet need for contraception is to be addressed promptly and effectively out of bias owing to the control of population size and the health of a family thereby an ideal community.